ninety-nine at Grand Indonesia is probably the only restaurant in Jakarta that manages to pull-off an outdoor-feel, while actually being inside a shopping mall! 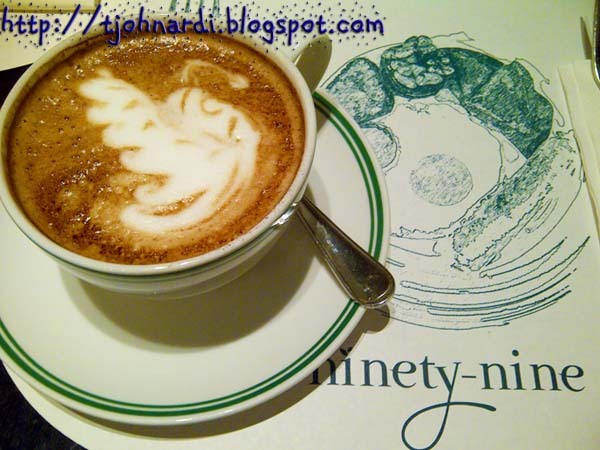 As ninety-nine is related to Ranch Market (an upper class supermarket chain that's reputable for its great quality & selection of fresh fruits) so you can expect the ingredients used in ninety-nine's menu to be just as great. ninety-nine offers a wider variety of dishes from Classic Sandwiches, Italian Pastas, Chinese Chicken Rice, to Indonesian Oxtail Soup. 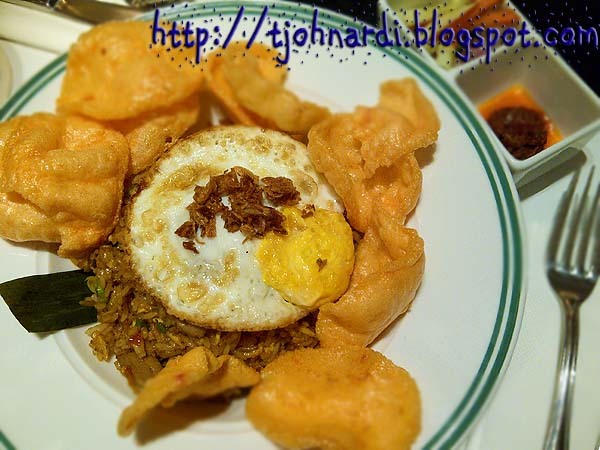 But my favourite remains with the Nasi Goreng Kampoeng. Both me & my sister agreed that ninety-nine's Nasi Goreng is THE BEST we have ever eaten. You have to try it yourself, to understand why, and I'm 90% sure that you'll like it. 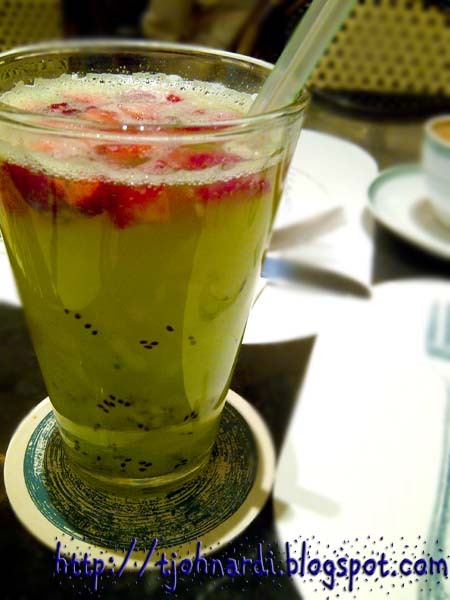 To accompany our hearty lunch, I ordered the warm Mocha Latte, while my sister had the Iced Kiwi Berry. I certainly needed some caffeine to fight the post-lunchtime drowsiness...haha. And the cake: It's Triple Chocolate cake, from the bakery right smack between Ranch Market & ninety-nine. The cake was simply made of 11 alternate layers of moist chocolate sponge and white chocolate mousse, topped with rich chocolate coating and generous shavings of white chocolate. 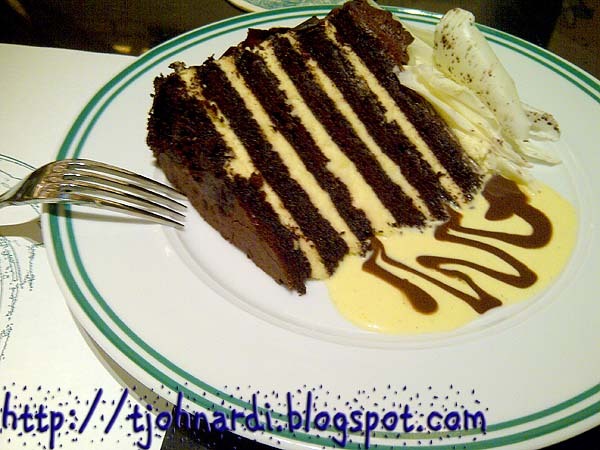 If you eat the cake at the restaurant, they'll serve it with rich vanilla vla. I am highly biased for ninety-nine, so I'm going to give it a rating 4 out of 5. Can't wait to report future visits with different food. Cheers! Hahaha seemingly ninety-nine got populous fans nowadays. I LOVE their cakes! I consume their carrot cake and lemon meringue cake religiously. That layers-of-goodness stacked on top each other forming a beautiful cake makes a very sinful display tempting every passers-by. Nasi goreng 48K, pakai telur matasapi, sepotong ayam goreng dada/paha dan sate ayam 2 tusuk. Agak mahal untuk sepiring nasgor, but ... menimbang lokasi di GI, harganya jadi "diangkat".